Poisson distributions are very important not only for counting events during a fixed period of time but also for different types of models, for instance, within credit risk management. 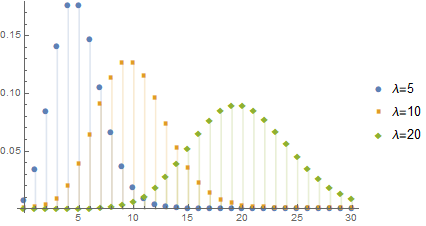 In this post we focus on the most important features of a Poisson distribution. where is the number sign. An event can occur times, i.e., the distribution range is . The possible number of events is not restricted upwards, however, the possible natural numbers can occur with quite different probabilities. 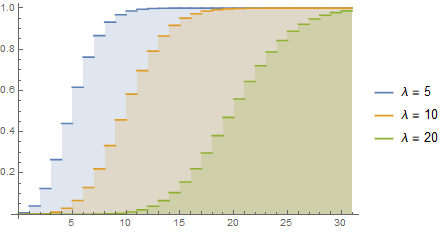 To make things simpler we can, however, normalize the time frame within we count the events to the unit interval . The probability that an event occurs in a given length of time does not change through time. That is, the probability of occurrence only depends on the length but not on the position of the sub-interval. If those assumptions hold true the random variable is governed by the Poisson distribution. 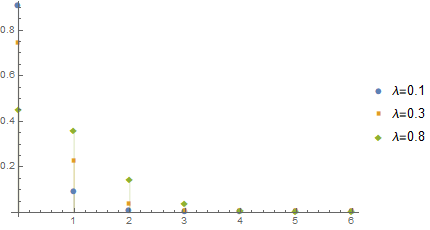 is distributed according to the Poisson distribution denoted by . What specific event we are interested in does not matter as long as the four assumptions above are (at least approximately) fulfilled. For instance, we could count the number of defaults occurring during a year, the number of claims to an insurance company within a business year and so on. The next exhibit, where different probability mass functions are plotted, shows that the probability of small values is greater if is smaller. The intensity parameter can also take on very small values. That is, if we choose small enough (e.g. ), it is very likely that we end up with a sample only containing . Corresponding examples are plotted in the next graph.